The yellow matt satin table surface and solid oak legs of the Penny Coffee Table gives this Scandi inspired piece such a warm and textured look, perfect if you want to create a cosy and inviting setting in your living area. 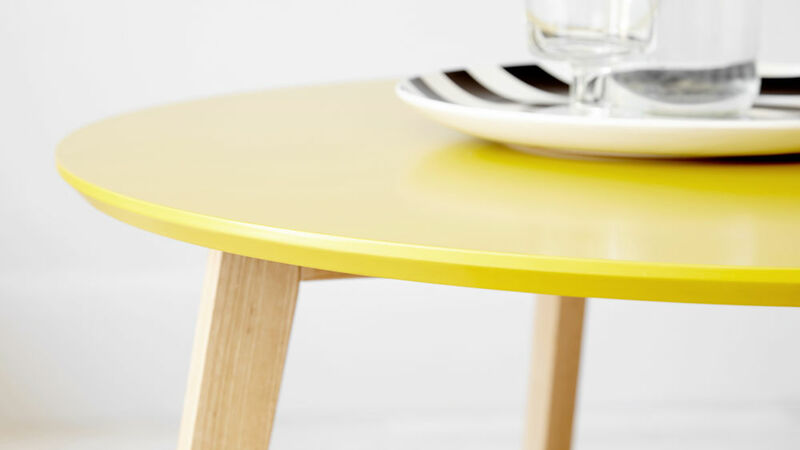 The striking yellow table top is counterbalanced by the tables slim and streamlined shape, creating a design of coffee table that is impactful yet not overpowering. 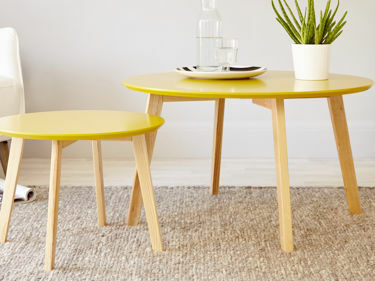 The Penny Coffee Table has a yellow matt finish which has a gentle sheen and wonderful tactile quality. A matt finish will still bring a bright and fresh look to your living space but is a much more subtle alternative to a highly reflective glossy surface. Yellow is a great option if you want to introduce a hint of colour to your space in a sleek and stylised way. The Penny Coffee Table is an individual piece but you could easily style it alongside our coordinating range of Penny Side Tables. This will create a larger surface area for you to place and store your items with the added option to move the coffee table and side table apart when needed. All of our Penny Coffee Tables come with floor protectors to prevent marking your flooring. This means the coffee table would work really well a hard floor, rug or carpet. 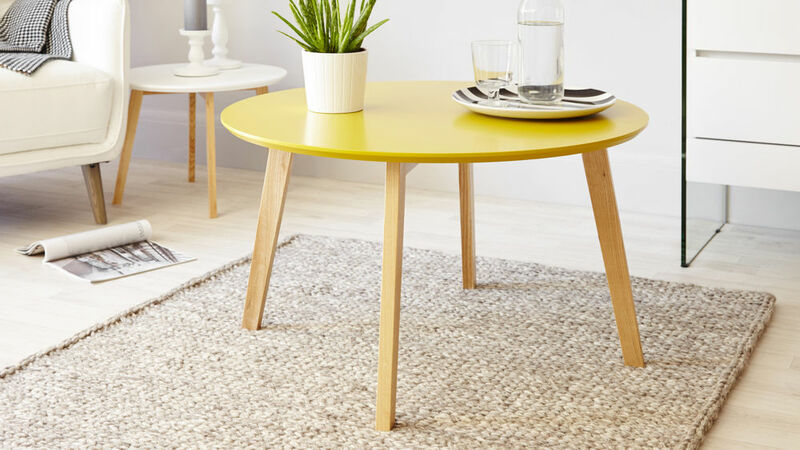 Clean and contemporary, this Scandi inspired Penny Yellow and Oak Coffee Table is the perfect piece for adding a fresh new look in your living interior. If you're after a more neutral tone, the Penny Coffee Table is also available in grey or white. The tables work really well together as the side table is slightly lower than the coffee table, creating a true style accent in your space. The Penny Coffee Table and Penny Side Tables create a good looking set together but it also means that you have two separate items when you need them, such as when you have family or friends round and need to pull up another surface to place drinks and snacks. 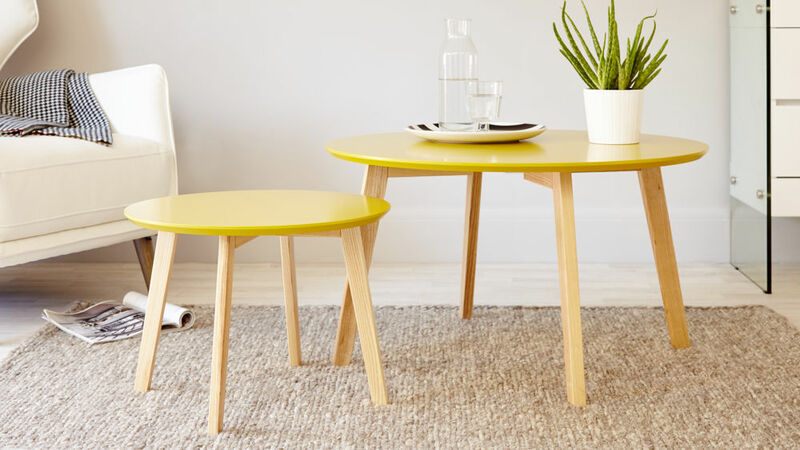 It’s also a great opportunity to mix up the colours in your space, as you could choose the Penny Coffee Table in Yellow with the Penny Side Tables in grey or white.